Students are encouraged to submit their papers to the IEEE BIBE 2013student paper competition, following the regular paper submission procedure. Submissions will be evaluated based on their originality, scientific merits, structure, and clarity of composition. All submissions will be peer-reviewed and finalists selected based on the merits of submissions must attend the Conference and present their papers as an oral or a poster presentation. The five finalists of the compentition will receive commemorative and monetary awards. The sponsor of the awards is BAIF. The winners will be also invited to submit extended versions of their papers in journal special issues on topics related to the conference. The Greek Community School of Engineering in Medicine and Biology Institute of Electrical and Electronics Engineers (IEEE EMB Greece Chapter) invites you to the award ceremony of the best thesis in the subject area of Biomedical Engineering / Biomedical Informatics conducted during the academic year 2011-2012. Step 1: Design your shirt by the deadline. Check out our new official video with all of our academic activities for 2011-2012! 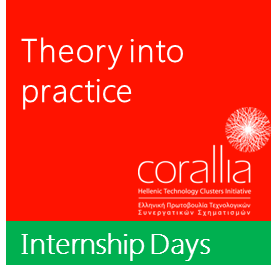 For the first year, Corallia in collaboration with the University of Patras, organize "Internship Day", on Tuesday, May 15th, 2012 starting at 10:00 a.m. in Patras InnoHub. With the slogan "Experience the world of Greek high-tech industries" event "Internship Day" is primarily aimed at informing students about the opportunities presented for training in high technology companies. The Greek Student Associations of Universities of Stanford (Hell.AS), Berkeley (Hestia) and MIT (HSA of MIT) in the U.S., with the cooperation of Corallia, organize for the third consecutive year the program Educational Trip and invite you to join and visit for one week a university of a global range, with the support of the institution Bodossaki and the company Sunlight. The organising committee of SFHMMY 5 invites for papers submission until 24 February 2012. On Friday the 9th of December, at 12:00 – 14:00, an open coffee - meeting will take place in the Electrical & Computer Engineering Department of University of Patras (Class HL 5), in which the student and academic community will get informed about the EMB Student Branch Chapter of the University of Patras and subscriptions will be open for anyone who wishes to join us! The IEEE EMBS Student Chapter of the University of Patras is holding a Seminar Series about Biomedical Engineering, during the current academic year.